Investors have long been told of the great promise fuel cells hold for generating cheap and clean electricity. Using little more than hydrogen (the most abundant element on earth) and air, fuels cell can generate electric power with water as the only byproduct. But despite the incredible potential of fuel cell technology to disrupt the energy market, it's been a long and arduous road to commercial adoption since its invention in 1838. Hydrogen fuel cells have been one of the toughest areas for growth-centered investors, with many seeing huge promise from the technology but few knowing how to profit from it. The disappointing truth behind fuel cell stocks (at least so far) is that anyone investing in them since their entry into public markets has likely lost a fair amount of money in the process. We've seen numerous waves of fuel cell hype among retail investors, but quarter after quarter, these companies have continued to disappoint, and the air has been let out of every bubble. Yet after a decade of declining stock prices, it's finally beginning to look like the fuel cell market may have a chance at meeting its once-lofty expectations. At the very least, it seems that 2016 is poised to be an especially attractive entry point. Below, we'll address a number of reasons you'll want to consider adding a few fuel cell stocks to your portfolio. We'll also be following that up by sharing our top three fuel cell stocks through 2016. The quickest way to lose money in the stock market is to get caught up in false expectations, but with most fuel cell stocks trading close to 10-year lows and volume as thin as it is today, it's safe to say that the majority “blue sky” investors have exited this sector already. The hype that once bloated fuel cell stock prices has, for the most part, come and gone. Keeping in mind the enormously high premiums once priced into fuel cell stocks due to their disruptive potential, 2016 is shaping up to be quite the attractive entry point for long-term investors. After many quarters of posting negative income, several fuel cell companies are finally turning the corner and have posted positive income for the first time in the history of this niche sector. While no company has yet proven consistently profitable, the tide is clearly shifting. In June 2014, for instance, a small fuel cell company by the name of Plug Power (NASDAQ: PLUG) recorded its first-ever quarterly profit. While the success of Plug was short lived, this moment signaled a crucial turning point in the niche fuel cell market. By the end of 2014, fuel cell turbine firm Hydrogenics (NASDAQ: HYGS) had followed in Plug's footsteps, recording a narrow quarterly profit by year-end. Then in the first quarter of fiscal 2015, another fuel cell company, known as Ballard Power Systems (NASDAQ: BLPD), recorded a positive bottom line of its own. The fuel-cell vehicle (FCV) is an automotive holy grail that promises the low emissions of a battery-electric vehicle (BEV) with the range and refueling convenience of a gasoline-powered car. And this once barren, niche market has very recently reached a clear turning point. This year, three fuel cell vehicles will be coming off the lots, including the Hyundai Tucson Fuel Cell, the Toyota Mirai, and the recently revealed Honda FCX Clarity. With each generation of fuel cell vehicles, these cars are becoming increasingly cheaper to produce while simultaneously lengthening their range and shortening fill time. The Honda FCX Clarity, for instance, boasts an impressive 435-mile range, a three-minute fill time, and a compact fuel cell powertrain that's one-tenth the cost of previous versions. Of course, costs still need to come down, and infrastructure needs to develop as well, but these same caveats once applied to plug-in electric vehicles, and just look where Tesla Motors (NASDAQ: TSLA) is today. With three major automotive companies now pushing fuel cell technology, it's only a matter of time before hydrogen filling stations begin popping up across the globe. 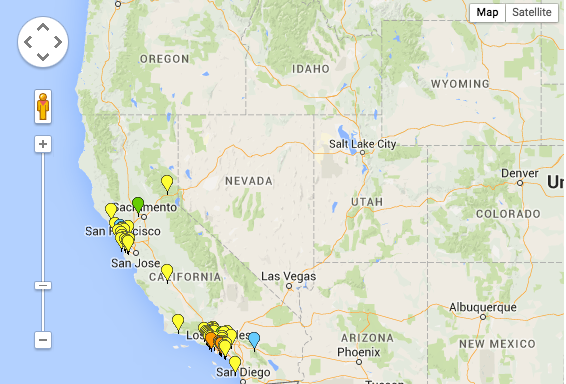 California will be the jumping point, with 46 stations currently in development, making for a total of 58 in the state. When investing in any market, it's essential to take industry forecasts into consideration. There are entire organizations dedicated to determining market size and predicting revenue outlook, so you're best off making use of that information. 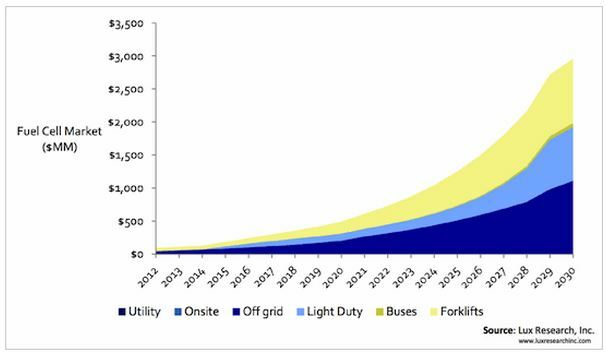 According to data from Lux Research, the long-term outlook for fuel cell revenue is absolutely enormous, and 2016 is the year its exponential growth will begin to take off. According to Lux, what's less than a $250 million market today is expected to end up being worth $2 billion in about a decade. Jointly, MarketWatch reports that the global PEMFC (Proton Exchange Membrane Fuel Cell) market is forecast to grow at a CAGR of 26.67% in terms of unit shipments through 2019. Market research firm Technavio holds a similar forecast for the global fuel cell market, with a CAGR projection of 30.40% during the same period. And according to Freedonia, “Global demand for commercial fuel cells will almost triple to $4 billion in 2017, and then triple again by 2022 to $12 billion.” Navigant Research offers perhaps the most bullish projection, predicting global stationary fuel cell revenue to reach $40.0 billion in 2022. While each of these research agencies break down the fuel cell market in their own way, some more bullish than others, the key takeaway here is that strong growth is expected across the broad fuel cell market in both the near and short term. Perhaps one of the most important habits of an intelligent growth investor is patience. As promising as any technology might be, it could end up taking many years to develop into commercial viability. It's OK to take gambles every now and then, but you don't want to jump the gun too early by betting the farm on unprofitable companies. When it comes to fuel cell stocks, you'll want to reserve any investments for the speculative section of your portfolio right now. Simply put, don't invest anything you aren't willing to lose, and keep an eye on the stocks you like until they show consecutive quarters of profit. Below is a list of six fuel cell stocks worth keeping an eye on, with further detail on our top three breakout candidates. Plug Power designs and manufactures fuel cell systems known as GenDrive and GenFuel that replace conventional electric batteries. At a market cap of ~$500 million, Plug is one of the largest hydrogen and fuel cell technology companies in the U.S.
Plug found its first viable market powering indoor forklifts, earning a number of highbrow customers including BMW, Wal-Mart, Mercedes, Kroger, and Whole Foods. However, it's expected that the company will soon branch off into several other verticals, including airport ground support, airport tuggers, transport refrigeration units, and hydrogen generation. Plug Power current holds the largest share of the North American Class 1, 2, and 3 clean energy lift truck market. The company also recently announced a joint venture with Axane, an Air Liquide subsidiary, to meet growing demand for its GenDrive fuel cell products in the European material handling market. In its most recent quarter, Plug Power reported its second consecutive quarter of record revenues, a massive increase in units shipped, and significant margin improvements. The company is well on the path to consistent profitability, and 2016 is looking like the year for that to happen. 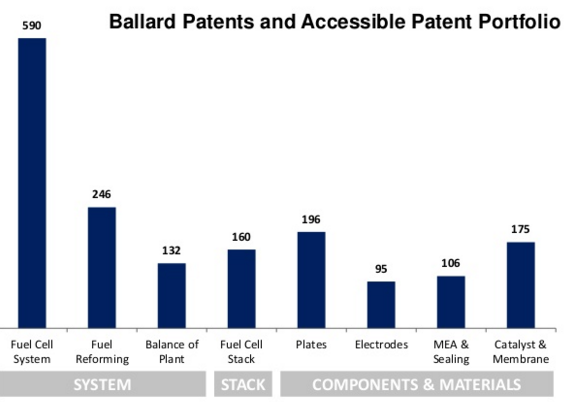 Ballard Power Systems is a relatively small, 400-employee company that designs and manufactures high-performance fuel cell stacks used in the material handling market. The company has a product portfolio of telecom backup power systems, grid storage systems, bus batteries, and forklift truck batteries, which it supplies to Plug Power. Ballard's line of power products is composed of three units, including stationary systems, motive modules, and fuel cell stacks based off the company's proprietary proton exchange membrane (PEMFC) technology. In addition to these core power products, Ballard also licenses its intellectual property for power module assembly in China. The company has a substantial portfolio of intellectual property, including ownership of ~200 patents and applications, as well as access to ~1,500 others. Ballard also operates a wholly-owned subsidiary known as Protonex, which develops several products with applications in military, commercial, and consumer markets — currently underserved by batteries and small generators. Protonex is also developing products for a number of different OEM customers looking to integrate high-performance fuel cells into their products and applications. Through 2015, Ballard Power Systems won an order for 300 buses from Foshan and Yunfu, cities in China. The company's revenue has been rocky, but this was a record order for the company and could signal the beginning of widespread adoption of fuel cell powered buses. FuelCell is an integrated fuel cell company that designs, manufactures, installs, operates, and services stationary fuel cell power plants. Specifically, the company provides distributed power generation for electric utilities, commercial and industrial customers, universities, and government entities around the world. In 2015, FuelCell Energy made tremendous progress in the U.S. with a number of large projects ramping up over the next several years. The company recently signed a 20-year agreement with Alameda County, California for a 1.4-megawatt fuel cell plant. Notably, this project is to replace a previous FuelCell Energy power plant installed back in 2006, which goes to show just how sticky these customers are. In addition to the Alameda plant, FuelCell recently won four new orders from the U.S. Department of Energy that will add approximately $24 million to its backlog. Three of these projects are related to the commercialization of the company's solid oxide fuel cell (SOFC) technology, while the fourth involves a carbonate fuel cell power plant. FuelCell is also gaining traction in Asia, specifically with a number of recent wins in South Korea. Most notably, the company has partnership with POSCO, a South Korean a multinational steel-making company that is licensed to manufacture Direct FuelCell (DFC) power plants in South Korea. As a part of this partnership, POSCO is building a new manufacturing facility in Pohang city with an initial production capacity of 100MW per year. While performance in the fuel cell market has been less than ideal over the last decade, stock buying opportunities are finally opening up for investors who have been patient enough not to speculate. With the majority of fuel cell stocks trading near all-time lows and profitability on the near horizon, 2016 is shaping up to be a promising entry point. Fuel cell companies remain high-risk, high-reward stocks, but a number of these tickers are worth keeping on your watch list as the industry shapes up through 2016. Look to Plug, Ballard, and FuelCell to be the ones leading the way.